Saffron Tandoori Restaurant offers a full restaurant buy-out, with seating for up to 110 guests and cocktails for up to 150 guests. For smaller events, there is also a private dining room with seating for up to 50 guests and cocktails for up to 60 guests. 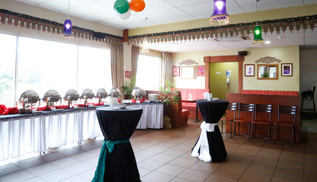 This venue is ideal for weddings, engagements, birthdays, anniversaries, corporate functions, product launches, small parties and private dining. The space can be transformed to suit countless events.